What do you know about songwriting? Listen for the same length, then you'll aim for fame! Syllabic stress is the best way to make your fans "whoa!" If you want to take a stab, slant rhyme can be sly! If you do not have writing in your journal from last week, take 3 minutes to write 3 sentences about one of these topics. Be sure to hit submit! Steps to Create your Chorus! "I wake up and hit snooze for 20 minutes"
"I run downstairs to make coffee"
Step 1: Identify 4 important words or phrases from your writing. Step 3: Decide how long you want each line of your chorus. You might ask yourself- Do I like that many syllables? Are there words I can omit? Are there words I need to add for meaning or rhyming? Step 5: Repeat steps 1-4 for your 2nd, 3rd, and 4th circled sections. Make sure you are choosing an EQUAL LINE LENGTH. Step 6: Write the whole chorus (4 lines) here. STOP: Raise your hand to check with a teacher that you have completed this part of your assignment. Done early? Read your lyrics to your neighbor 5 times. If you notice certain natural rhythms to your words, try writing them down in your journal! 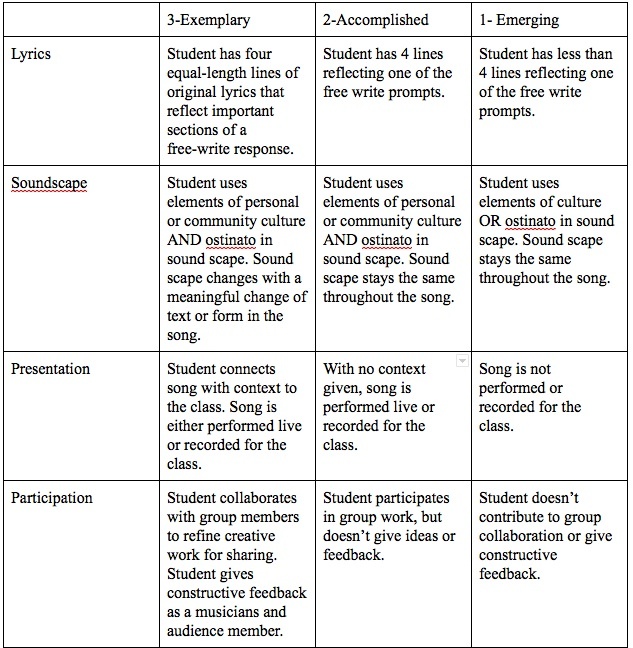 A sound bank is a collection of sounds or ideas that you take to your group members that are related to your lyrics. When you create your sound bank, think about what sounds represent you. Do you have a pet at home that makes a certain sound? Is there a certain kind of music or beat that always occurs in your household? What kinds of sounds do you hear in your classroom? For each sound in your sound bank, tell me why it is related to you or your lyrics. Are you done with your melody or soundscape? Try these electronic music tools to give you new ideas. If you like what you find, try notating (writing) what you did on a fresh sheet of bar-line paper. 1. This link allows you to create vocal arrangements. 2. This link helps you think about ostinato and how to notate it. 3. Here is an online keyboard! If you are done with those three, pick another one from this website!